The communion service John Wesley sent to Methodists in America in 1784 began with the Lord’s prayer and a collect, followed by a liturgical recitation of the Ten Commandments. Wesley adapted the Methodist service from the 1662 Book of Common Prayer. The Ten Commandments had a prominent place in Anglican worship almost from the beginning. The Decalogue first appeared in the liturgy for communion in the 1552 Book of Common Prayer. You can still see the commandments posted in old Episcopal churches that have kept their antique architecture. The 1979 Book of Common Prayer retains the liturgical Decalogue in the section on the Eucharist, and a version can also be found in the United Methodist Book of Worship. Needless to say, this, like much of our rich liturgical tradition, has fallen out of use in United Methodist churches. I commend the commandments for liturgical use, especially in Lent. See The Decalogue for a liturgical setting adapted from the traditional form, with the language of the commandments modernized and abbreviated. What Do You Mean by Liturgy? When I say I love Christian liturgy – and that I think it is important for the life of the church – I am often misunderstood. People think I mean that I like to read words aloud that are printed in a worship bulletin. That’s not quite right. What I mean is that I like the prayers, songs and other acts of worship that have deep roots and broad usage in the church. In other words, I value the liturgy we have inherited from our Christian forebears. One of the benefits of a set liturgy is that you memorize large parts of it through repeated usage. Eventually, you don’t need to read the words from the bulletin or the hymn book. You know them. They are a part of you. They rise up within you as you recite them. I really don’t really like to recite words composed on Tuesday for use on Sunday, to be thrown into the recycle bin on Monday. Of course, some contemporary liturgies are even worse if you actually reuse them. Few of them are weighty enough to endure for hundreds of years or to unite the church across the generations. Their novelty wears out very fast. They have the lasting appeal of a 1970’s kitchen in an HGTV remodel. The word “liturgy” can mean several different but related things, depending on context. Cultural Liturgy. If liturgy is a community’s habitual practice of certain rituals to impart meaning and instill desires, then liturgy is everywhere. It’s not just a church thing. Cultural liturgies attempt to shape our hearts and minds in much the same way that Christian worship does. The writings of James K. A. Smith explore this topic in detail. The secular world may not call them liturgies, but Christians recognize the patterns of religious worship when they see them. Religious Liturgy. Every Christian community has a worship liturgy. It’s not just a high church thing. The Baptist church to which I first belonged sang “Just as I Am” to conclude every Sunday service. They never would have described the ritual as “liturgical,” but it was. If your church has a pattern of worship that it regularly follows, that’s its liturgical form. Shouting “Amen” during the sermon and praying, “I just want to thank you, Father, God” are just as much forms of liturgy as standing to sing “Alleluia” before the reading of the gospel. Written Liturgy. People commonly use the word “liturgy” to describe forms of worship that have written prayers and readings for the members of the congregation to recite, whether these forms are of recent or ancient vintage. Historic Liturgy. The Church, in its various forms, has inherited confessions, prayers, hymns, acts of praise and other modes of worship from earlier generations of Christians. Many of these forms have been in use for centuries, some for millennia. These acts of worship represent the received faith, one that we share with Christians across the generations. Lex orandi, lex credendi. As we pray, so we believe. Official Liturgy. Liturgy can refer to the “the whole complex of official services, all the rites, ceremonies, prayers, and sacraments of the Church, as opposed to private devotions.” (Catholic Encyclopedia). For United Methodists, Bishop Scott Jones has written that our approved liturgy is one level of our church’s official teaching. Eucharistic Liturgy. In Orthodox and other Eastern churches, the word “liturgy” refers only to the primary Eucharistic service of the church, the Divine Liturgy (Θεία Λειτουργία). Even Arabic-speaking Christians describe the Eucharist as al-liturgiah. 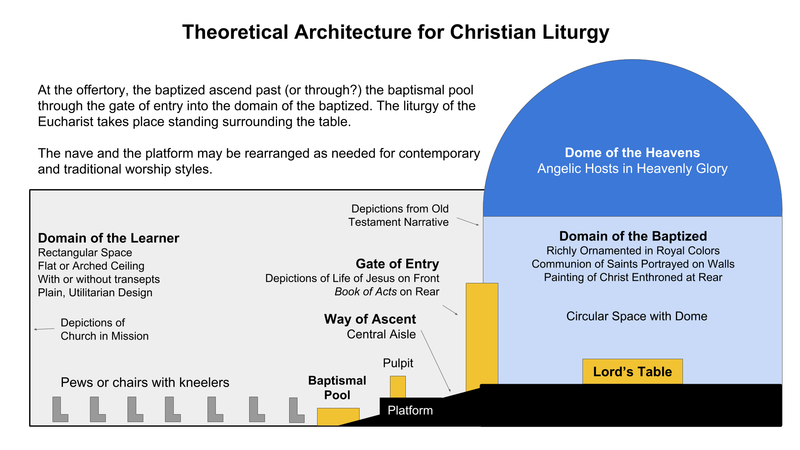 When I say that I like liturgical worship and think it’s important for the life of the church, I mean layers 4-6. More on that tomorrow. Where Did the Church Get the Word “Liturgy”? Many Christian are aware that the Greek word liturgy (λειτουργία or leitourgia) derives from roots that mean “work of the people.” This is one of those cases in which etymology can lead you astray. In its civic context, the word originally referred to any public service which a citizen performed at his own expense. Although the work or gift could involve supporting the public religious cult, the word’s use was not limited to religion. Any work of public service or civic good could be a leitourgia. The word acquired its distinctively Christian usage, however, through the early Christian scriptures. The Greek translation of the Old Testament (commonly known as the Septuagint) was the Bible of the early Church. In the Greek version of Exodus and Joel, leitourgia is one of the words used to describe the ritual service of the temple and its priests. Similarly, in the writings that would become the New Testament, leitourgia also refers to worship in the temple, both literally and figuratively. Luke 1:23 says that Zechariah (father of John the Baptist) returned home when he completed “the days of his leitourgia ” in the temple. Using the language of the temple cult, Hebrews 8:6 tells us that Jesus is our great High Priest who “has been given a leitourgia that is far superior to the old priesthood, for he is the one who mediates for us a far better covenant with God, based on better promises.” In Hebrews, the liturgy of the earthly temple foreshadows the liturgy of the heavenly temple, where Jesus is both priest and sacrifice. See the Catholic Encyclopedia for the source of this information. I envision a worship space that I know I will never see in reality. It’s the product of a number ideas rolling around in my head. Central to my vision is an understanding that worship is a physical act, not just a mental and emotional reality. 1. In the Eucharist, the baptized join the whole church on earth and the whole host of heaven to sing the song of the seraphim. I take that almost literally. At the table of the Lord, a door opens between heaven and earth so that we can see what Isaiah saw – the Lord, high and lifted up. At the table, we can see what John saw – and the Lamb who was slain at the center of the throne, with all the elders falling on their faces before him. I envision a worship space that portrays that reality artistically, and which allows Christians to live it kinetically.